Bringing your own water using your preferred water container or bottle is far more cost effective than purchasing bottled water every time you go out. Moreover, you can bring any kind of beverage with you to help you stay hydrated as well as refreshment during your activities. Hydro Flask is one of the best options when it comes to vacuum insulated water bottle. Two of their most popular bottles are the 21 oz. and 24 oz. ; to help you decide between both, we collect brief information about them in our article below. Hydro Flask is a brand of vacuum insulated water bottle from the same name company, which based in Bend, Oregon. This company has been manufacturing water bottle since it was founded by Travis Rosbach and Cindy Morse in 2009. The former couple created Hydro Flask bottle based on their experience when their water becomes lukewarm after a day spent at the beach. Even though the couple doesn’t last, the company does. Hydro Flask was acquired by Helen of Troy in 2016 for $210 million and the company continue to strive to bring its customers new, innovative solutions to keep their beverages stay at their temperatures. Hydro Flask is a success story of small brand that turned big in just few years. The brand is very popular and have been included in countless articles and won various awards from different magazines. The company also included in Inc. magazine’s elite group of 500 fastest-growing private American companies 2 years in a row. Hydro Flask even announced multi year partnership with World Surf League (WSL) that will make the brand integrated with every Championship Tour event in North America, as well as Hawaiian Pro and Vans World Cup of Surfing events. 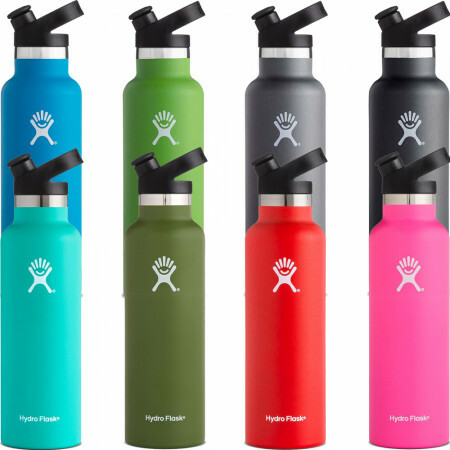 Hydro Flask offers their customers several types of vacuum insulated bottles. They current lines are hydration, coffee, beer and wine, and food flask. Aside from those, they also offer additional bottle’s accessories and even gear, such as shirts, hoodie and hats. The hydration line is consisting of standard and wide mouth water bottle, kids water bottle, and Tumbler. The one we put in our picture above and what are we going to talk in the rest of this article is the standard mouth with 21 and 24 oz. capacity. If you are interested on other vacuum insulated bottles, you may want to read our article on Hydro Flask vs Thermo Flask here. About Hydro Flask 21 oz. and 24 oz. The standard mouth comes in various sizes, caps choice, and colors from the smallest 18 oz. to the biggest 24 oz. and standard cap to sport cap. With this wide of choice, you can pick the one match your need whether you want the small one to fit easily in your hand while on the go or the bigger one to take on your adventure, Hydro Flask have all the options. 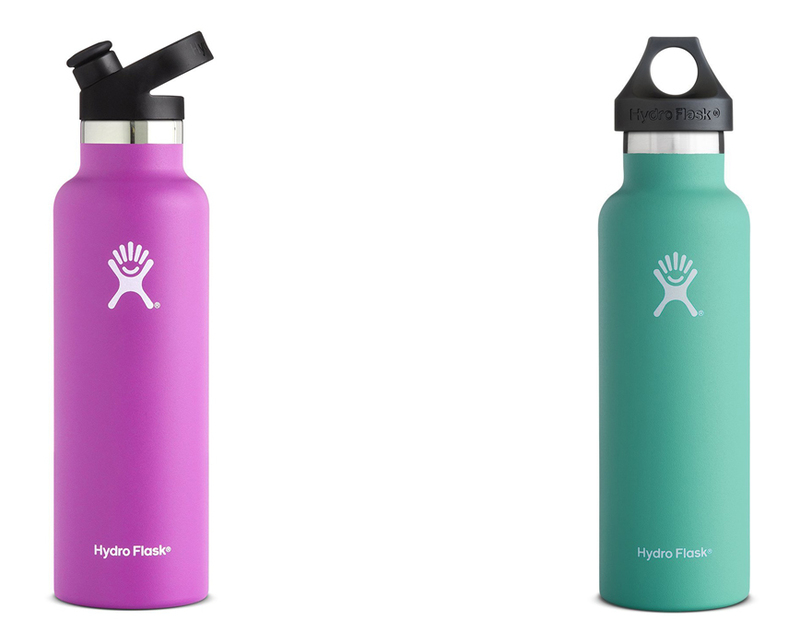 Aside from its capabilities, Hydro Flask bottles are known for its colorful bottles. In the 21 oz. version you can choose between 11 colors, including 3 new colors, such as Pink Flamingo, Blue Blueberry, and Green Olive, but these colors options only available with the standard flex cap, while the one that comes with sport cap, only have 6 colors. But worry not, since you can purchase the cap separately if you want to change it with the one you want. The 24 oz. also comes with 11 color choices and standard flex cap. Hydro Flask 21 oz. and 24 oz. have the same technology and capabilities but separated by capacity. These bottles are designed to keep your water or beverages stay at their original temperatures longer than regular water bottle as well as help you stay hydrated throughout the day. The 21 oz. is small enough to fit in your pack’s side pocket or your cup holder, while the 24 oz. is big enough to keep you hydrated from before your activity, during, and after. Both of them are claimed to be able to keep your water temperature stay longer in the bottle with its proprietary technology called TempShield. TempShield is the double wall, vacuum insulated technology that keeps the temperature of your water longer. The technology makes ice water stays cold until 24 hour and hot water stay hot for up to 12 hours, so you can enjoy your drink just how it should be. The company also guarantees you that there will be no condensation or hat transfer to the outside of the bottle, so you can handle it without caution. However, if you put hot water inside it is recommended to keep the bottle away from children to avoid them accidentally drinking hot water. 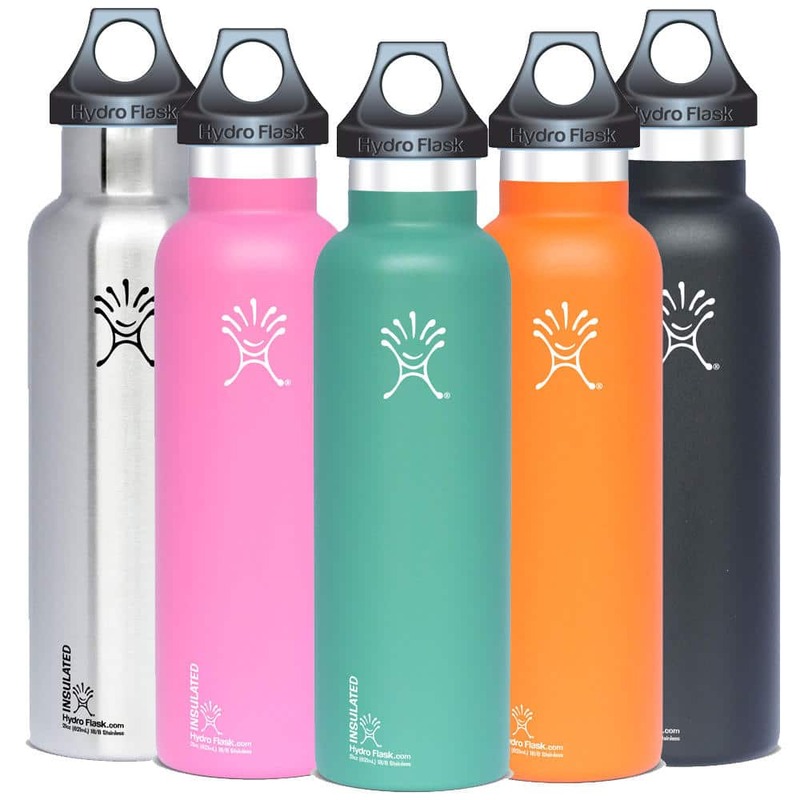 Hydro Flask products, whether it is bottles, tumblers or food container are made with 18/8 pro grade stainless steel, which is known for the strength and purity. This material will not retain any taste and will not transfer any taste to your beverages or foods, so your today’s drink will not taste like yesterday’s drink. The 18/8 stainless steel is also tough enough to be your adventure’s partner; to help you stay hydrated anywhere and anytime. To enhance their capabilities to retain water temperature, Hydro Flask 21 oz. and 24 oz. are featured with caps with Honeycomb Insulation technology, which have the same construction as a beehive, but this technology only available in standard flex cap. The caps are made from flexible and durable TPU material as well as wide handle to ease you when carrying the bottles. Hydro Flask products are BPA free to ensures users that their drink will not accidentally altering their genetic makeup. As an addition to the TempShield technology mentioned above, Hydro Flask 21 oz. and 24 oz. outer body are coated with their signature powder in various colors for comfortable handling, slip free and add extra durability. After reading our article above, you must already know that both bottles are actually the same and only separated by their capacities. However, they do have some differences besides the capacity and price, such as the caps choice since Hydro Flask 24 oz. only comes standard flex cap. But, as it has been mentioned above, you can change the cap by purchasing it separately. In the price, the 24 oz. is slightly pricier than Hydro Flask 21 oz., but the gap is very narrow, so you shouldn’t mind about it. All in all, the decision is all yours to make. Both of them serve the same purpose and have the same features, so you may base your choice on your need. If you prefer the small one or plan on refilling it later, you may want to pick the smaller 21 oz., but if you don’t want to refill it often or plan to take it on activities, such as hiking and bicycling, you may want to choose for the bigger Hydro Flask 24 oz.